Named as ‘Best Medium SUV’ at the 2019 Carbuyer Best Car awards, the PEUGEOT 3008 SUV has been praised for providing the SUV sector with a stylish family car which is enjoyable to drive. The ‘Best Medium SUV’ award from Carbuyer is just the latest in a range of awards picked up by the PEUGEOT 3008 SUV in 2018, after being named ‘Best Family Car’ in the UK Car of the Year Awards 2018 and ‘Best Medium SUV of the Year’ in the 2018 Fleet World Honours. With the addition of the Carbuyer award, the PEUGEOT 3008 SUV has now won an incredible 61 awards globally since launch. The PEUGEOT 3008 SUV has proved to be a great success, with 430,000 sold worldwide and almost 37,000 in the UK. The compact SUV features cutting-edge technology including the innovative PEUGEOT i-Cockpit®,12.3” head-up digital instrument display and 8.0” capacitive touchscreen with Mirror Screen® functionality, comprising of Android Auto, Apple CarPlay™ and Mirror Link®. Steve Fowler, Editorial Director of Carbuyer said: "The PEUGEOT 3008 SUV remains the outstanding choice in the medium SUV class, despite its ever-expanding band of rivals. It does the family car job with aplomb but still manages to remain great fun to drive. With sharp looks and that class-leading cabin also in the mix, it’s a hugely appealing ownership proposition and a worthy winner." 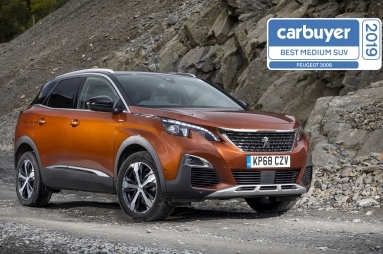 David Peel, Managing Director at PEUGEOT UK, said: “To be named Best Medium SUV for a third year in a row is a great achievement for the PEUGEOT 3008 SUV. The award stands as a testament to the PEUGEOT 3008 SUV’s lasting popularity and proves how the compact SUV is still making an impression. The Carbuyer Awards present 26 accolades, with the winners determined by the car types that received the largest search volume and page views on the carbuyer.co.uk website in the last 12 months. The individual categories reflect the sectors that matter most to in-market car buyers. The PEUGEOT 3008 SUV can be fully configured and ordered using PEUGEOT’s industry leading ‘Order Online’ facility at www.peugeot.co.uk.